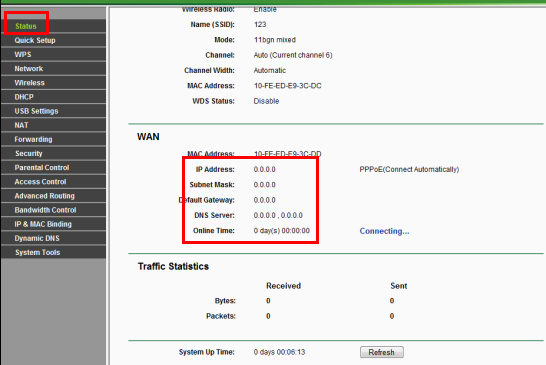 How to setup TP-Link wireless router with Unifi? Note:Please prepare the Username and Password from Unifi for your internet service first.If you are not sure,please contact Unifi to get the information. It only applies to those routers that have unifi mode. Step 1Connect your computer to the LAN 2,3,or4 port of the TP-Link router. Connect the Unifi modem to the WAN port of the TP-Link router. Step 2 Open the web browser and in the address bar type in domain name or IP Address of the router. And then press Enter. Step 3 Type the username and password in the login page. 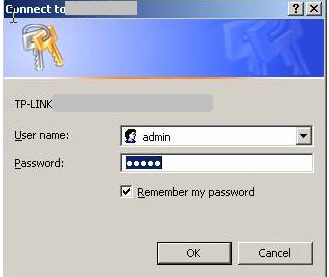 The default username and password both are admin. Step 4 Click Quick Setup and click Next.Then Working Mode choose Unifi Mode and click Next. 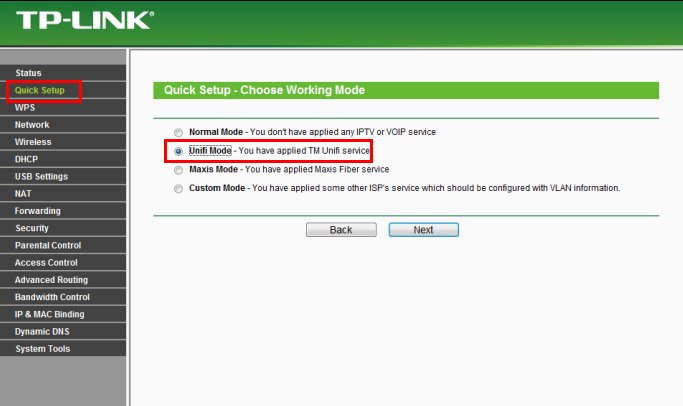 Step 5 This page is for setting up the VLAN of the IPTV,don’t change anything and click Next. 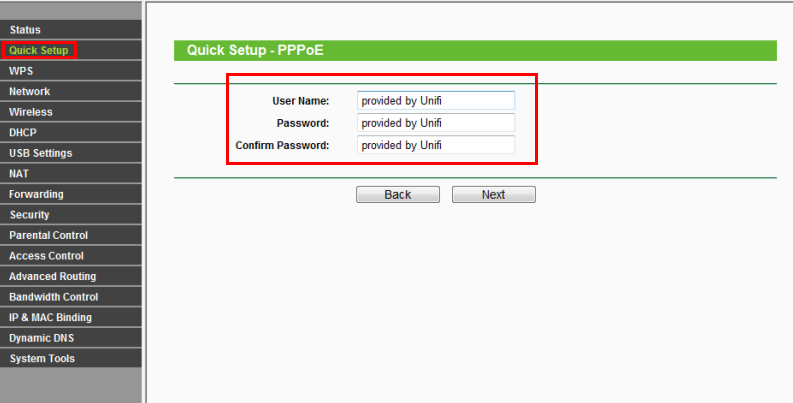 Step 6 Put in the Username and Password from Unifi,click Next. 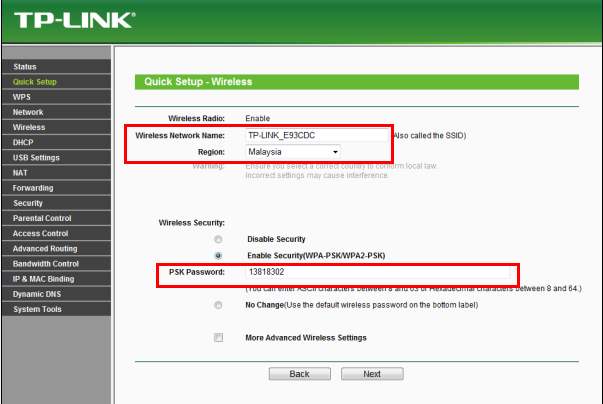 Step 7 You can create your own Wireless Network Name and Password on this page,Region please choose Malaysia,click Next. (For dual-band routers,you will be required to set up the wireless for 2.4GHz and 5GHz). 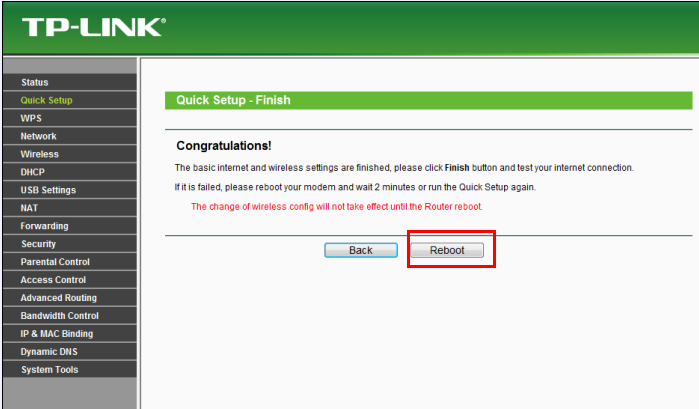 Step 8 Click Reboot.Wait for the router to reboot itself ,at the meantime,please power cycle the Unifi modem. Step 9 After the modem and router are rebooted,please go to Status page,check WAN section,if the IP Address shows 0.0.0.0,please double check your Username and Password from unifi and do the Quick Setup again.If it shows other numbers,that means the router is configured successfully. Step 10 Connect your TV to LAN 1 and try the IPTV service.